Not all portable generators have the same sales features or have the same electrical configurations. Electrically, some come fit with internal neutral-to-ground bonds and some do not. Some come fit with GFCI output circuit breaker protection and some do not. They come in an array of size and power capabilities, fuel capacities and starting options. The potential list of electrical hazards varies with the specific generator design and the specific use case. All failure scenarios are complicated, involving many possible combinations of equipment and circuit variables and faults. Changing one variable can greatly affect the probability and impacts of any particular safety outcome. Ships sink. There is never just one cause. It’s always a constellation of cascading negative events and poor decisions. The same thing is true here. Despite USCG and other advice to the contrary, the manner in which most people use portable generators on boats is to connect them to the boat’s shore power inlet to charge permanently-mounted batteries, make coffee or run air conditioners. Attached to the boat in that way, the generator looks like shore power to the boat’s electrical system. At least, that’s the intent, if not the reality. Many small portable generators do not have neutral-to-ground bonds. In a properly wired boat, there should not be a neutral-to-ground bond(s) in any part of the shore power electrical system aboard the boat. The shore power neutral-to-ground bond is in the shore power infrastructure, ashore, and comes aboard through the shore power cord. But with a portable genset, if there is no ground at the generator, there is no known, fixed output polarity to the generated voltage. There is 120V between the receptacle pins of the current-carrying conductors, but this is a “floating neutral” system. What can happen in a floating neutral system is not always entirely predictable. Floating neutral systems were what we had in homes in North America prior to the 1950s. The electrical dangers of these systems lead to the National Electric Code and the grounded neutral systems we have today. ABYC-recommended Reverse Polarity indicators on 120V boat circuits measure the voltage across the neutral and ground conductors. In a floating-neutral system, Reverse Polarity indicators may not properly indicate reverse polarity. Surge suppressors in consumer electronics can’t work, since there’s no path to ground. But these are not the most serious of the possible range of issues. Picture a group of boats rafted together enjoying a leisurely weekend cruise. However unusual it might be, consider the possibility that two adjacent boats in the raft are running floating-neutral portable generators at 07h30 to charge batteries and make coffee. One of the two has installed an “Edison plug.” If the handrails of these boats are bonded, there is a possible shock hazard between the two boats. And, that shock hazard is likely worse in salt water than fresh water because of the better conductivity between the two hulls. If there is no neutral-to-ground bond in the electrical system, there is no fault-clearing path in the event of a ground fault, which is all by itself a serious fire and shock hazard. If a portable genset is placed in the woods and an extension cord is run from the genset to the boat, any fault onboard can dump power into the water and the fault current will flow through the water back to the portable genset. That is a threat of variable, unknown and unknowable potential impact with a floating-neutral system. It is also more dangerous to people, pets, farm animals and wildlife in fresh water than in salt water. Above, we considered what can happen in a system with no neutral-to-ground bond. Now, consider the result of having more than one neutral-to-ground bond in a system. Even though ABYC requires no neutral-to-ground bonds aboard the boat when running on shore power, we know from experience with the rollout of ground fault sensors on docks that as many as 50% of recreational boats do have them. That’s one of the most common reasons that some boats trip the new ground fault sensors. So now take the situation of a boater who uses an “Edison plug” with his portable generator. Now we have the generator circuit’s ground conductor paralleled with the ship’s ground which in turn is cross-connected to the ship’s neutral. Now we have a path for power to escape the generator’s intended neutral return circuit and a generator equipped with output GFCI breakers will trip power “off.” Continuously. Not only is there no power, but the cause is “obscure” at best. Is the generator broken, or just misused? Who ever asks that question? On land, the National Electric Code is adopted by statute (and administered as regulatory codes) in all 50 states. For boats, there is no such “law” (“lawless”); there is only the ABYC and the NMMA. The ABYC Standards are “voluntary recommendations,” only loosely, unpredictably and inconsistently “enforced” through the efforts of individual surveyors and the marine insurance industry. But the truth is, no one can actually stop a boat owner from doing something unsafe on their own boat. I have personally witnessed boat fires caused by people who did their own thing because they thought they understood the risks they were taking. On land, in similar manner to the NEC, the use of portable generators in commercial job sites is regulated by OSHA (through regulatory code). OSHA does not allow “Edison Plugs” on a portable genset on a job site. In fact, OSHA requires a Generator Transfer Switch in a specific configuration if a building system is to be powered by the generator. In a construction site situation, the option of a floating-neutral does have its appropriate purpose; it eliminates the potential of a worker being shocked by contacting a hot output conductor and the generator frame at the same time, which can occur if an electrical device such as a hand held tool suffered an internal short circuit. Portable generators are typically not ignition protected. They can produce a spark, such that if gasoline fumes were present, those fumes could ignite. ABYC requires that all electrical equipment on a permanently installed gasoline-powered generator must be ignition protected. Gasoline-based fuel tanks, hoses and fuel fittings on portable generators do not meet ABYC requirements for materials used in fuel systems on boats. If a fuel leak were to develop, the potential for a fire is not insignificant. If there were a fire originating from another source, the tank, hose and fittings on the portable would not have the fire resistance that is required of permanently installed gasoline engines. The vast majority of portable generators are located on the deck of the boat, resting on their own vibration-damping feet. There is no fuel retention tray that would capture an accidental fuel leak or spill. Someplace in this discussion I need to comment on electric-start units. Batteries and the wiring of batteries to portable generator starter motors are a source of safety concern. This must be done in a way that ensures ignition protection and overload protection. Carbon Monoxide in significant concentrations can kill in an amazingly short period of time; just a few breaths. 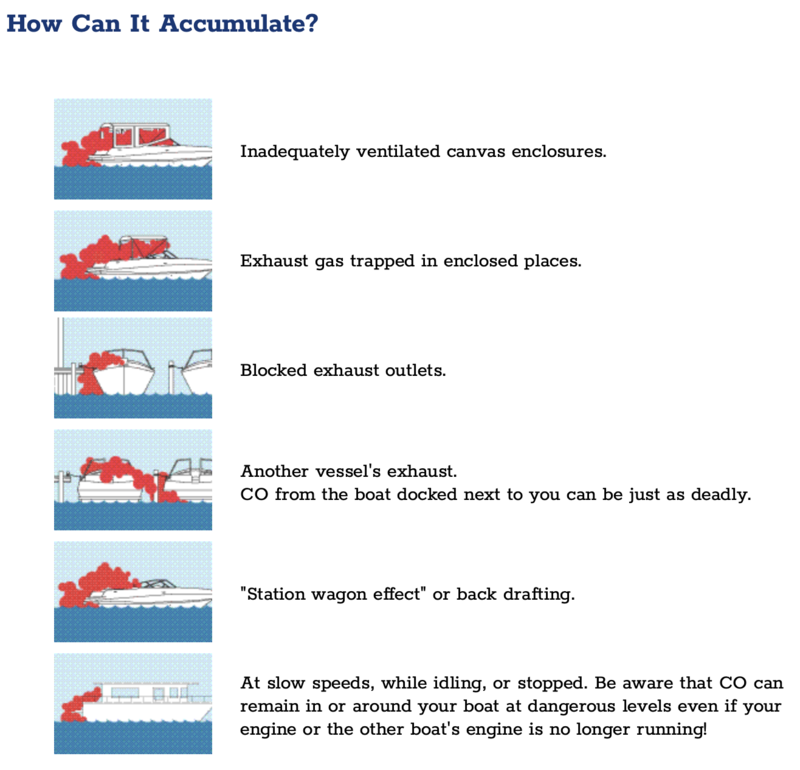 Carbon Monoxide will collect in the eddies of air currents flowing across a boat. In most cases, the boat is anchored at the bow, so CO frequently concentrates in eddies at the stern. Trawlers and cruisers offer large, flat vertical elevations at the stern for this to happen. Boaters who swim off the stern of a boat, or who’s children or grandchildren swim off the stern, are at high risk. Nearby boats are, of course, also at risk. If air currents are right, a boat running a gasoline generator can flood a nearby neighbor with CO.
And I would presume to add one more item to this list. Sanctuary is a slow trawler. From time to time when moving at the same speed and in the same direction as the prevailing breeze, we can smell our own diesel exhaust. The same thing can occur with generator exhaust. Diesel exhaust has very little CO, but the odor always requires that we take action to increase ventilation. Moving on from theory to reality, big numbers of people do use portable generators on boats, and they mostly get away with it. The vast majority of them get away with it through blind luck. All of these scenarios require multiple simultaneous failures for the real risks to actually be realized. But none of these risks are present with a permanent generator installed to ABYC standards. To quote the title character in the 1971 movie, Dirty Harry, “do you feel lucky? Well, do you…..?” Well, do you? There is a reason portable generators are less expensive than made-for-purpose marine generators. Portable generators are not intended for use on boats. They do not meet marine standards. Manufacturers state that these products do not meet electrical codes. They are not warranted for use on boats. No acknowledged boating safety expert or organization suggests, recommends of approves their use on boats. Knowing these facts, we are all left do whatever we think is best. This entry was posted in Portable Generators - NOT For Boats on 2019/03/21 by gilwellbear.